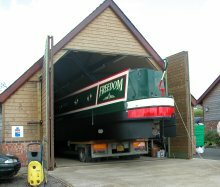 Here at St Mary's Marina we have purpose-built facilities for every boater, whether you are a weekend cruiser or staying a little longer. We have a permanent office building which provides a small library service together with a visiting Post Office (one day per week), and there are the usual toilet and washroom facilities (which includes full showers). There is also washing room with a washing machine and dryer. There is a chemical disposal point at the front of the marina for the safe and clean disposal of WC cassettes, and there is also a pump-out facility. The marina also has a diesel pump for filling up your tank.